Anet A8 3D Printer Upgraded Version DIY Printer with Filament is a useful yet affordable 3D printer, for beginners and enthusiasts alike with its capable extruder and hot bed. The A8 is able to print a variety of filaments. The A8 is built intuitively with a slick user interface Comes unassembled with video instructions Detailed Overview A solid and capable Prusa i3 variant, the Anet A8 is an extremely popular model. The printer comes with Auto levelling position sensor to give user a seamless 3D Printing experience.It comes with Half Kg Filament free of cost. Packaging and Shipping charges Extra. Anet A8 3D Printer Upgraded Version DIY Printer is a useful yet affordable 3D printer for beginners and enthusiasts alike with its capable extruder and hotbed. The A8 is able to print a variety of filaments. The A8 is built intuitively with a slick user interface and comes unassembled with video instructions, detailed overview a solid and capable Prusa i3 variant, the Anet A8 is an extremely popular model. It comes with Half Kg Filament free of cost. It has a large customer base and lots of available customization to kick-start your 3D experience. The A8 is the affordable price, as a result, it makes it a favourite among consumers. This printer is a 3D printing powerhouse. It boasts a large print area and very capable NEMA17 motors to navigate the print space. The 3D printer is useful for STEM Labs, Atal Tinkering lab therefore easy for students to learn. The A8 comes stock with a versatile extruder and heated bed, which makes it capable of printing a diverse selection of filaments. The printer is easy to assemble, hence easy for a human mind. Part placement is intuitive and straightforward, and the board comes prelabelled with all of you’ll need to know. The firmware provides an easy to navigate interface. This printer is controllable using Repetier Host or independently use a GCODE file and a micro USB card. Technical Support available over Call/Skype in Business Hours Mon-Sat from 9:00-6:00 p.m.
Packaging and Shipping Charges are extra. Acrylic or Aluminum Composite (Aluminum surface with plastic structure) XY Axis Accuracy: 0.012mm Z-Axis Accuracy: 0.004mm Number of Extruders: 1 Extruder Diameter: 0.4mm Max Print Speed: 100mm/s Max Print Size: 220x220x240mm Nozzle Temp. : Adjustable, Maximum 250C Hot Bed Temperature: 50 to 100C Heating Plate Material: Aluminum Printable Materials: PLA, ABS, TPU, Wood Poly, PVA, PP, Nylon, Luminescent Filament Diameter: 1.75mm Data Input: microSD or USB. The Best DIY Printer available in India. Bought this product from gugglu and it got delivered in 4 days. The Service is fast and secure. Best Printer in this price range, DIY is the best part. 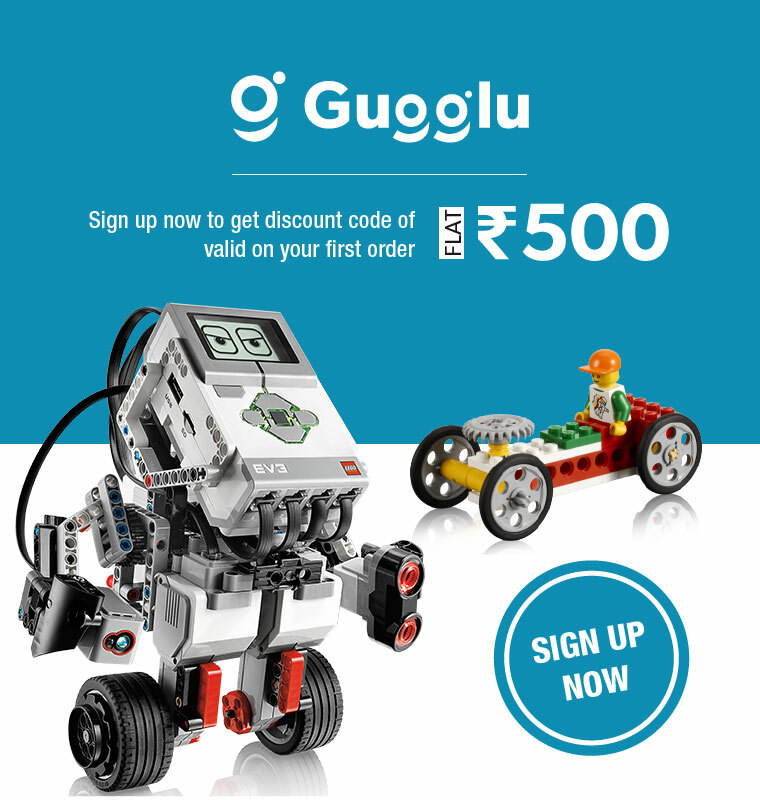 Exceptional delivery by Gugglu.com. I m quite satisfied by the print quality at this price range. Its the best 3D printer for beginners. Its all about how you did the calibration of all the axis. So nice of the sellers for including all types of tools with a card reader and a SD card. I assembled it in 4 hrs. If u are up for a 3D printer ,I would suggest to go for a diy kit rather than an assembled one because first ..its amazingly cheap…and second, you will be easily able to upgrade it as you know which part goes where. And….its much bigger in size than u think (atleast for me) and can compete other expensive 3D printers easily.